GOP candidate for the 14th CD Senator Chris Lauzen released his 13-point immigration policy today . . .
Word is that former 17th CD Congressman Lane Evans' chief of staff/now U.S. Rep. Phil Hare will have a challenger in 2008 after all. . . and the decision will likely be made official tomorrow. What’s the difference between CNN’s behavior this week and the quiz show scandals of the 1950’s? Not much from this vantage because both appear to be designed to purposely mislead the public for an organizational advantage. When the producers of "The $64,000 Question” or “Twenty One” fed answers to the contestant they favored, they did so to dislodge one contestant in favor of a more “attractive” one. In that way they stood to get better ratings and higher rates for their commercials. At this week’s debate in Florida, it appears CNN packed the forum with videos having the same objective--to dislodge the Republicans’ chances to win the 2008 Election in favor of their preferred, Democrat contestant. Jersey County Coalition for Public Awareness is a local group that has been fighting the good fight against taxpayer abuse for several years, led by county resident Jeff Ferguson. I met Jeff a few years ago, and he and a friend spent a couple of hours recapping an array of illogical events that he uncovered surrounding a local school district bond issue, the razing of an old school building, the construction of a new one on the same plot of land -- all against the wishes of local voters. There have been many sincere testimonials to Henry Hyde but my personal memory of him will always be his sense of humor. I was Henry's press secretary during his first campaign for Congress in 1974 and I was with him all of election night. A large number of Republican candidates around the country were getting clobbered in the voter backlash to both Nixon's resignation in August and Ford's pardon of Nixon a few weeks later. But late election night, Henry's margin of 5,000 votes over former Cook County State's Attorney Ed Hanrahan was holding. At a party that night, I informed Henry that his old adversary and GOP Speaker of the Illinois House, Rep. W. Robert Blair of Will County, had lost his seat. Henry slowly grinned and said, "My cup runneth over." I was grateful that quote was too late for the morning papers. UPDATE: Hyde visitation and funeral arrangements made public. . . Thursday, 12/6, 3 to 8 p.m. visitation and Friday, 12/7, 10 a.m. funeral, both to be held at St. John Newman Roman Catholic Church, Rt. 64 just west of Pheasant Run, St. Charles. Was it a ploy or an oversight? Did CNN purposely enlist a pro-gay general to participate in their debate Wednesday night, or was it simply poor background checking? Keene said he became "convinced that Mitt Romney represents our best hope for 2008" and added that in the weeks remaining before the Iowa caucuses on Jan. 3, 2008 he would work to persuade "my fellow conservatives that if we are serious about electing a conservative president in 2008, it's time to unite behind his candidacy." Link: ACU President David Keene Endorses Romney - The Fix. MoveAmericaForward.Org's 40-city "Honoring Heroes at the Holidays" tour will miss the Chicago area this time around, but you can still support their efforts by visiting their website. We'll be participating in MoveAmericaForward's great effort this year. Our U.S. Army 4th Infantry son-in-law won't be home for Christmas. This week he began his third tour in Iraq. ARLINGTON, VA -- U.S. Senator John McCain's presidential campaign announced that Illinois State Representative Jim Durkin will file John McCain's ballot petitions for the state of Illinois at 8:00 a.m. CST today at the state board of elections. John McCain 2008 also announces the endorsement of Robert D. Stuart. Ambassador Stuart is former Ambassador to Norway and former Illinois Republican National Committeeman. In addition, the campaign is proud to have the support of Ms. Julie Brady, who will now serve as Deputy Co-Chair of our IL team. Ms. Brady is a former Department of Justice prosecutor. When the time comes as it surely will, when we face that awesome moment, the final judgment, I've often thought, as Fulton Sheen wrote, that it is a terrible moment of loneliness. You have no advocates, you are there alone standing before God and a terror will rip through your soul like nothing you can imagine. But I really think that those in the pro-life movement will not be alone. I think there will be a chorus of voices that have never been heard in this world but are heard beautifully and clearly in the next world and they will plead for everyone who has been in this movement. They will say to God, "Spare him because he loved us," and God will look at you and say not, "Did you succeed?" but "Did you try?" Just when you thought you couldn’t think of anything worse that Springfield politicians could do, you find something more outrageous than whatever turned you off last time. It used to be that if you wanted to run as a write-in candidate, for precinct committeeman, for instance, you just asked your friends to write-in your name. Mike Royko used to do a column almost every election reciting how many times Mickey Mouse was written in. The write-ins were a way to show disgust for the politician in question. Politicians don't take well to ridicule. Republican candidate for 14 CD Jim Oberweis said Thursday he rejects the FairTax plan, and chooses rather to introduce a six-point tax reform plan he believes will act as an economic stimulus and if enacted, will produce federal revenue over the long haul. 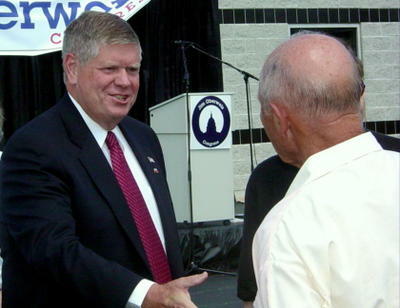 Oberweis is one of three GOP candidates in the February 5, 2008 primary to replace former Speaker Dennis Hastert. Aware Hastert has voiced support for a consumption sales tax system over the current income tax code, Oberweis said if FairTax was enacted without a repeal of the federal income tax, Americans could end up with both a national sales tax and the current income tax system. A few months ago, I wrote an open letter to NFL Commissioner Roger Goodell, asking him to please help "raise the standard and do what [he] can to eliminate the indecent content aired during NFL games." As you may remember, my original letter pointed to the sad fact that a number of advertisements and network promotional spots that are aired during NFL game breaks are completely inappropriate -- especially for the younger members of the viewing audience. The fact is, far too many of these ads are indecent and/or sexually suggestive. With more than half the season behind us now, I am again openly appealing to Commissioner Goodell: please consider your entire fan base when licensing your programs to television networks. "Today we mourn the passing of a legend. Chairman Henry Hyde’s faith in God, his dedication to family and his devotion to the people he served will always be a reminder of what is good and true in politics. . .
(BATAVIA, November 29) - 14th Congressional District GOP candidate Jim Oberweis - responding to news that former U.S. Representative Henry Hyde passed away early this morning - today lauded Hyde for his service to his community and his nation and offered condolences to his family and friends. "Henry Hyde was a giant in the Congress," said Oberweis, "and the Congress's greatest defender of unborn life. Not for nothing is the federal law that prohibits the use of taxpayer funds to pay for abortion services known as the Hyde Amendment. Passed just a few years after the Supreme Court's Roe v. Wade decision, the Hyde Amendment has been in place now for more than three decades, ensuring that no federal taxpayer dollars are used to pay for abortions on demand. It is conservatively estimated that the Hyde Amendment prevented, over the course of the last three decades, at least one million abortions - that's one million Americans who are alive today because of Henry Hyde. The Hyde Amendment, it can be said without exaggeration, is the most important piece of pro-life legislation ever enacted. “Congressman Hyde unequivocally embodied the title of statesman in every sense of the word. His leadership when speaking on the House floor drew attention from each member in the chamber. The clarity of his thoughts, the wisdom of his foresight and the principled values he espoused were unmatched. “When I worked for Henry more than 20 years ago it was obvious I was in the presence of a man whose convictions, beliefs and actions were one in the same. Henry truly represented Illinois’ 6th Congressional District with the utmost distinction and will forever be remembered for his work. It is with great sadness that we learn today of the passing of Congressman Henry Hyde - a great man, a true leader, and an American statesman. For more than a quarter-century, Congressman Hyde served us with distinction in the U.S. House of Representatives, providing consistent conservative leadership aimed at improving the lives of all Americans. He was a role model and an inspiration to me. His reasoned, experienced, rational and bi-partisan approach will be sorely missed. In the coming days and weeks we will have the opportunity to celebrate the life and accomplishments of this American hero. Some of you may have seen the excellent story in November on FNC Brit Humes' Special Report program featuring Congressman Peter Roskam's story of how he won his election during a blue tide wave which washed across the US a year ago. I saw it on Wed., 11-21-07. They focused on how he basically grew and kept his grass roots organization in action about a year prior leading up to the election. I can personally attest to this, as being on the Congressman's Finance Committee, he had many meetings, where he would say confidently, "I'm Peter Roskam, and I'm running for Congress." He is as confident today as he was then. Illinois Review grieves the loss of former Congressman Henry Hyde this morning. Hyde just received the Presidential Medal of Freedom earlier this month. Henry J. Hyde -- known for his courtly manners, oratorical skills and historical knowledge during 32 years as the conservative voice of the western suburbs in Congress -- died today, according to the office of House Republican Leader John Boehner. He was 83. Link: Henry Hyde dies at 83 -- chicagotribune.com. The CTA dilemma is still a dilemma this morning, when downstate lawmakers refused to back a plan during Wednesday's special-called legislative session that would make their downstate constituents pay for a mismanaged Chicago-only transit system. They want to see the money in a capital program that would benefit their districts' roads, bridges, schools, etc. Such a program will require funding. And since there's no money stashed away for a rainy day, and because the state's so far behind in paying its bills -- to Medicaid, for example -- there's no choice, they say, but to look for "other funding," instead of scrapping the old way of doing things and searching for leaner, meaner, long term solutions. It's sort of like not being able to buy groceries, pay your doctor, put gas in your car and keep the electricity on, but facing the added pressure of having your car's transmission go out, your house's roof spring a leak and its cracking foundation collapse. What's would a person do? What would you do? Too early to ask for support? IR Editor: Thanks so much! Thanks to each of our participants tonight -- you guys really made the debate lively and interesting. Thanks to Eric Wallace, Bob Schlereth, Jon Zahm, Charlie Johnston, Brady Alder for your excellent participation and input. Can't wait to hear more from each of you in the days ahead. . .
Who won the debate? Romney, Huckabee, McCain, Tancredo, Paul, Giuliani, Hunter? If you missed tonight's GOP CNN Debate, don't fret -- you get another chance to see the YouTube questions asked of the candidates here. We had representatives from several candidates' campaigns participate in online comments and questions . . . check them out here. Very strong performance for Huckabee. Engaging, confident, sincere. No trip-ups. I'm not as big an advocate for the Space program, but he gave it a good defense. Clear winner. The Romney/Giuliani immigration debate was fairly big. I think Rudy loses big on this issue, because people are smart enough to see through the personal insults and look at the facts. It was a good debate. I liked the back and forth amongst the candidates. It was interesting. Rudy Giuliani: He reminded me of why I support him. He is authentic and will take the heat on what you don't agree with him on rather than trying to trim his sails. I disagree with him on some important things and agree on some other important things. I admire his record of accomplishment in New York both before and after 9-11. That I can trust what he says when I don't like it suggests to me I will be able to trust what he says when I do like it. He's authentic, warts and all. Ron Paul is polling ahead of Fred Thompson and Huckabee in New Hampshire. It is curious to me why he has gotten less than four mintues of airtime. Good strong answer on gays in the military by Huckabee and Hunter. McCain just put the issue to rest. He is having a good night. CNN's bias came out with this whole episode. Ooooo...I hate Duncan Hunter's response to the gay question. Huckabee got close to it. Romney is closest of all so far in figuring out the key issue - our military is there to win wars. Enough social experimentation, already.
. Now he’ll have to explain HOW he reduced them. Before he would just imply that he reduced them by saying that he’s proud of the reduction. Romney believes the citizens should have no input about how "terrorists" should be treated. Only the elites should know. McCain did his righteous indignation thing on Romney over waterboarding. Somebody tell McCain that the terrorist don't follow the Geneva convention. The G convention was between sovereign countries. We are not fighting a country but an ideology that does not follow or recognize conventions or treaties. McCain's arrogance is getting to be irritating. He is beginning to use his tragic experience as the reason he should get any respect. It's tragic. Make his Secretary of Defense and get him off the podium. Wow, with his answer on Islamic terrorism, Giuliani demonstrated the main reason I support him. He gets it. We have to survive to get anything else done. I do so much respect the heroism of John McCain. I so wish he didn't also support such goofy things as McCain-Feingold. Man, the Republicans here are almost all differentiating themselves from the surrender monkeys on the Democratic side of the equation. Rudy doesn’t seem to be doing well, he got booed again while speaking on Guns. I loved Romney’s answer about black on black crime, though I didn’t love his commercial-it was okay. People are sometimes surprised to find I oppose the death penalty in modern contexts. I think it valid when it is the only effective means of protecting society, and is not necessary in modern society. However, it annoys me to no end when people suggest that pro-lifers are hypocrites if they support the death penalty. There is nothing hypocritical in believing that the guilty should be punished and the innocent spared. The left's position that the innocent should be punished and the guilty spared is both immoral and incoherent. Jon, Mike is a great guy. His stances are good on many issues but he is weak on immigration. Home Run for Huckabee on the death penalty! Awesome explanation on the difference between abortion and executing a criminal. Great answer on the Bible too. Sincere, reasoned, humble. I have to agree with Mike on the bible question. Well done Mike. The guy with the Bible was very creepy - and I am convinced he was chosen by a media that wants to find the creepiest people they can and hold them up as what a Christian is. It was a less-than-subtle attempt to discredit Christians as creepy. Sicko media creeps. Jon you are in fantasy land. What debate are you watching? Fred is doing great. His stances on taxes, 2nd amendment and Roe v Wade are sound conservative stances. Rudy is hitting it out of the park on the crime issue. He took a ton of heat from the local medai for what he did, but in answer to the questioner, Rudy Giuliani was the best friend of those who had been in crime-ridden neighborhoods, including black neighborhoods. I find I am more pro-life than any of the candidates. I do not think it enough to overturn Roe v. Wade and return it to the states. That is merely to replace the large one-headed monster we face now with 50 smaller but equally determined monsters. I support an amendment enshrining innocent human life as an inalienable right.